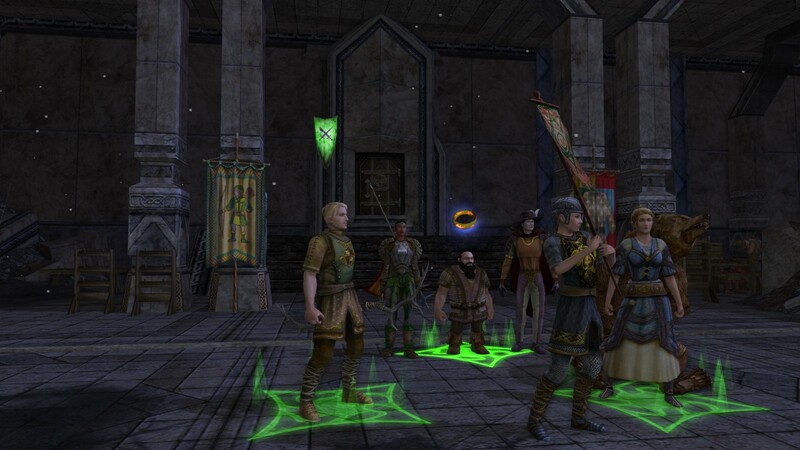 Despite the fact that premium member Mr. Randomessa shelled out for the Legendary pre-order of the Rise of Isengard package, as far as our characters are concerned, Isengard is that place far-off where some wizard sits and does … stuff. We are only level 26 and so still working our way through Volume 1, Book II, and so we’re hanging out with a different wizard these days. At our level we’re also trying to delve into skirmishes, a feature towards which I have had deeply hostile feelings given past experience with my Minstrel (subject to change post RoI class revision). It turns out that not only is skirmishing in a duo more fun than doing it solo (which I suspected), but being a Lore Master and Captain we are virtually invincible (which I didn’t count on). I taunt, he stuns, I heal, he cures disease, I Last Stand, he feeds me power. 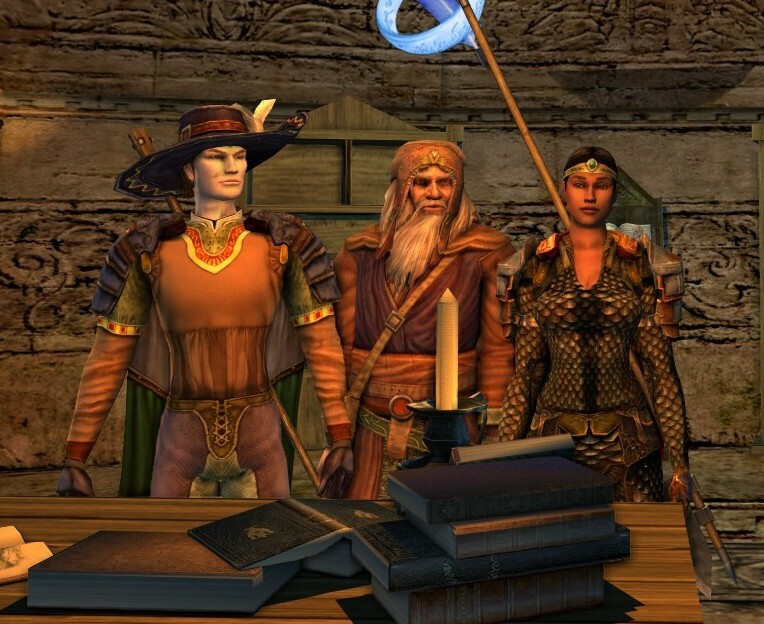 Moreso than in any other MMO we’ve tried, the classes of our choosing are complementary in a really exceptional way. We’re practically a small fellowship of our own. We’re taking our time leveling, in part because we’re trying to keep our crafting levels current wherever we are. This is where LOTRO chafes a bit, because in contrast to Rift, where for mere minutes of work we were making items that were valuable or even higher level than we could use or wear, we can’t break down our work for materials in LOTRO and I’ve complained elsewhere about the amount of materials it takes to master each tier. Still, we’re muddling through somehow; it helps to have a partner to grind with, especially one who doesn’t seem to mind combing through ruins filled with half-Orcs in order to break open Antique Vases and see what’s inside. Especially when said partner then makes you delicious, power-granting potions and extra crafting crit-chance scrolls. The fact that premium players are still locked off from playing any other Monster Play characters but the Reaver means that Mr. Randomessa still can’t access his Defiler, and is cause for much sadness. The 795 Turbine Points to unlock the class would near clean out his 1000TP from the RoI pre-order, which he’d wanted to hang on to for skirmishes and perhaps a quest area on sale; personally I think that MP character price is quite high. It may be that my husband will have to satisfy his PvP jollies in another game on the side, which is a real shame. Still, we’re enjoying ourselves otherwise, which just goes to show that sometimes you have to let the wine age a bit before you can appreciate it. Or something like that, anyway. I feel like I’ve become a pod person. I’m grinding for deeds and enjoying it. I’m mining ore I don’t even need, in order to craft hundreds of ingots I then send to my husband so he can make me weapons. I’m leading him to abandoned ruins and running interference while he examines broken urns in order to craft up battle scrolls for us to decimate virtually everyone in combat… which we do, handily. Today, I took Mr. Randomessa to Bag End, and then off to meet Tom Bombadil. I think he was pleased. Oh, and the following wasn’t a new experience for me, but it was a nice cap to the evening. I’ve not had much to say since returning from PAX, in part because my real-life social activities took a heavy upswing, in part because a health panic over one of our cats had us running for the emergency care clinic on more than one evening (he’s on the mend, many medications later), and lastly because I’ve been digesting the latest change to my gaming schedule. I’ve gone back and forth on LOTRO for years now, from beta testing to purchasing a lifetime subscription, through many un- and re-installations. It was, in fact, the first MMO that Mr. Randomessa and I played together when we were dating. 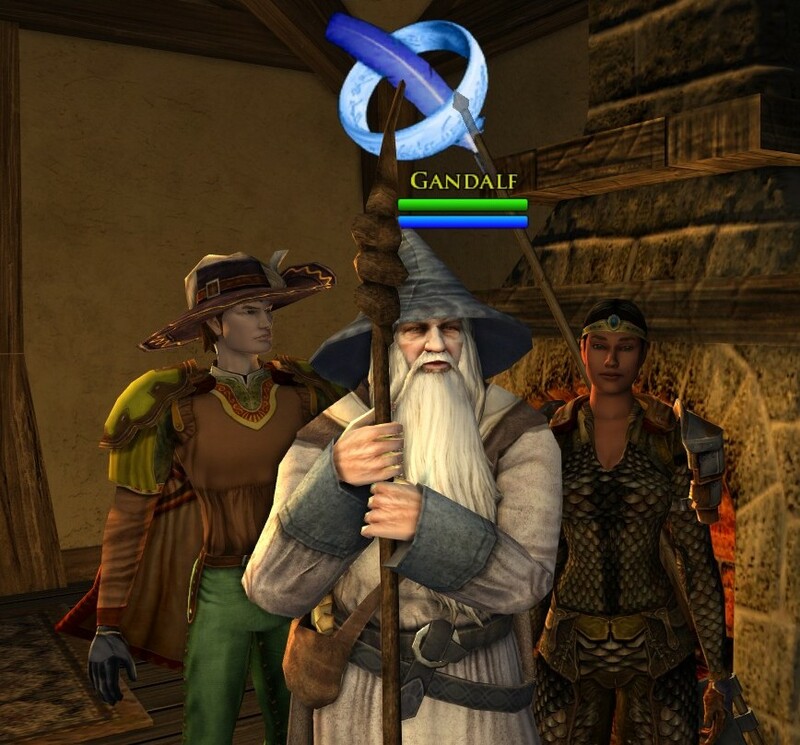 As a huge fan of the series brought in by the movies (blasphemy, I know, but I assure you I’ve read the book since, and The Hobbit, too), LOTRO has always seemed like precisely the kind of MMO I ought to enjoy. In reality, I’ve struggled to progress and find my niche among the classes and races on offer, no matter how many I tried; I’ve butted heads with the MMO-trinity design and slower-paced large world travel; I’ve sensed that the game has immense charm, but failed to be hooked long enough to delve deeply and explore it. In fact, in my impressions of LOTRO in the past, coming to it as a Guild Wars player, I can’t help but see parallels between my impressions and those from some players of other MMOs who come to Guild Wars. Namely, there has been an issue of playing the new game as if it were the old game. I have played too many classes as though they were my Elementalist, and found them wanting…. as Elementalists. Somehow, this time something seems to have flipped a switch. Since I picked up a voucher for a free mount at PAX, I re-downloaded the game just to redeem it and give my characters a little gift. Suddenly, running around in the world again and trying out a bit of combat, class roles “clicked” for me. I tanked with my Guardian instead of just flailing around hitting skills on cooldown. I figured out the optimal ballad tiering rotation for my Minstrel ballads. I tried out a Warden, became a tiny Hobbit hurricane packing a spear, and immediately understood why everyone loves that class. I rolled a new Captain (the class I always dreamed I’d love), named my Herald ‘Rosco’ and fell in love with on-defeat skills. I played for hours past my bedtime, and Mr. Randomessa, compelled by my enthusiasm, even dusted off his Lore-Master and we’re running around Northern Bree decimating everything in sight. The change in my approach and reaction to the game is like night and day, and for the first time I can see myself sticking with it, wanting to progress past my perpetual roadblock somewhere on the eastern end of the Lone Lands. The now-old news that Monster Play will be opened up to non-subscribers with the arrival of Rise of Isengard has Mr. Randomessa’s interest piqued as well. We haven’t put down any money yet – and having yet to reach level 20 with our new characters, buying new content or perks hasn’t been an issue – but if this continues we won’t have a problem throwing Turbine some cash for content. My past mixed feelings aside, I’ve always felt that Turbine has been one of the most masterful handlers of the F2P MMO transition on the market, and we’d love to show them some love if we make it to the gates of Moria and beyond. Of course, that will take some time… we’re in no rush to reach level cap with us just starting to settling in to our roles and the world around us. Again, but with more feeling!